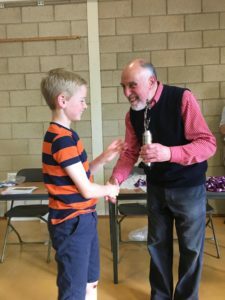 The Delancey Schools Chess Challenge may be the biggest children’s chess event in the world. It is played in three stages, 1) Megafinals 2) Gigafinals and 3) Terrafinals. 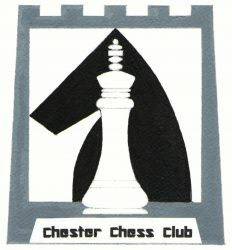 Chester Chess Club was represented by 16 children of whom 10 qualified for the Gigafinals. There were some very good, and some surprising results, and a few disappointments. In the difficult 12 to under 18 section we saw three fine performances from Zach Bragg 12, Milan Kustos 13 and Abdelrahman (Boudy) Mahmoud 14, all qualifying and finishing on 3.5/6. A little disappointing were Jack Yang and Nethuli Saram who scored 3/6 and 2/6 respectively. Jack, not to be denied, played in the Cheadle Hulme event a few days later and scored a terrific 5/6 to become the Supremo of his section. Efe Kitis who didn’t play in the Chester event also qualified with 4/6 finishing in 2nd place at Cheadle. In the under 10 section Harry Rafferty scored 4.5/6 and qualified comfortably in third place, but the sensation of the section was Mira Kustos who booked her place in the next round with 3.5/6. There were more surprises in the under 7 and 8 section where George Turner scored 4/6 for 2nd place and Yehia Mahmoud also qualified with 3.5/6. Thanks to Jixin, Graham, Paul and Keith for helping to organise the event. The Club AGM will be held on June 12th at 7.30pm at the Town Crier. This Sunday saw members of Chester Chess Club take part in the first Crewe Rapidplay at the Ibis Styles Hotel. Mike McDonagh and Colm Buckley were the representatives from Chester in the Open, and as luck would have it, they met over the board in round 1 (a draw, if anyone was wondering)! 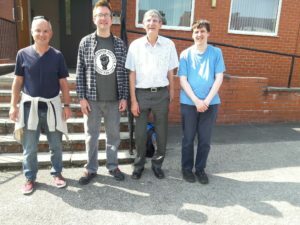 In the Major there was myself and our former secretary David Hulme, albeit dressed in Crewe Chess Club attire! David very kindly offered to pick me up from the station to save me rushing to make the first round. 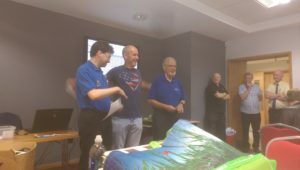 The end of the congress saw Mike finish on 2½/6 but Colm (pictured below after receiving his cheque) went one better scoring 3½/6 – losing only to IM Laurence Cooper and drawing with winner Mike Surtees in the final round. Elsewhere I finished on 3½/6 and narrowly missed out on a share of 3rd place after failing to convert a winning endgame. David Hulme, in his first congress in 15 years, ended on 3. Results and standings can be seen in the links below. 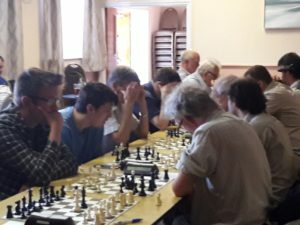 Keith Emerton, pictured below in trademark concentration pose, pulled off the tightest win against Bolton 2, reaching the win with only a couple of seconds left.